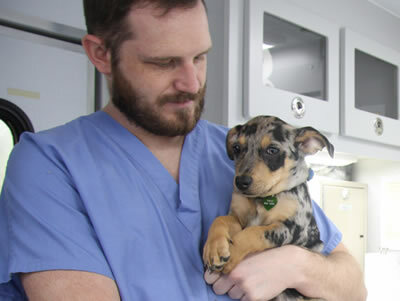 The University of Missouri College of Veterinary Medicine will offer a Small Animal Medicine Short Course on Oct. 13 for veterinarians and technicians. Topics will include urinary disease, renal disease, pneumothorax, respiratory manifestations of gastrointestinal disease, and protein losing enteropathy. Participants can earn eight hours of continuing education credit. Registration will begin at 8:30 a.m. with lectures starting at 9 a.m. and continuing until 6 p.m. Along with the traditional lecture format, instructors will also lead participants through practical, interactive case-based discussions. Carol Reinero, DVM, PhD, DACVIM-Small Animal Internal Medicine, professor of small animal internal medicine, will present, “Pneumothorax: Stop the Leak.” The lecture will provide information on how to quickly recognize and manage pneumothorax and identify the cause. Megan Grobman, DVM, MS, DACVIM, postdoctoral fellow in small animal internal medicine, will detail, “Respiratory Manifestations of GI Disease.” Grobman will explore how coughing can be the first sign of gastrointestinal disease. Small Animal Internal Medicine Professor Leah Cohn, DVM, PhD, DACVIM-Small Animal Internal Medicine, will present the lecture, “Ur-in(e) Trouble,” reviewing the clinical approach to lower urinary disease including key elements for successful management. The cost of the course is $260 for veterinarians and $55 for technicians, which includes breakfast, lunch and a copy of the proceeding notes. The program will be held in Adams Conference Center at the College of Veterinary Medicine. To register for the course, contact Teresa Egbert, small animal office supervisor, at (573) 882-1802, egbertt@missouri.edu. For questions, contact Egbert, or Amy DeClue at (573) 882-7821, decluea@missouri.edu.